Every hobby has its learning curve, and embroidery is no exception. Avoiding mistakes can save you time, money and frustration. Reviewing these top 20 common—and avoidable—embroidery mistakes, and you'll know what to avoid before starting your next embroidery project. Always read the instructions. Using the wrong thread or number of strands of embroidery floss is one of the most common errors that happens when you skip reading the instructions. With kits, this can lead to running out of thread before completing the project. It also may result in a different line thickness than intended. Most forms of surface embroidery require a firm fabric foundation, often with a thread count of 28 or higher. Using an embroidery fabric with a lower thread count can result in poorly-formed stitches, although you can add stabilizer to create a better surface. Counted Thread or Pulled Thread projects require a lower, looser thread count. This makes it easier to pull and remove threads and create lacy stitches. Use sharp needles when the needle and thread need to pierce the fabric, as in surface embroidery and crewel. Use ball-point needles when the needle needs to slip between threads in the fabric without piercing them, as in counted thread, pulled thread, and Hardanger embroidery. Although not the worst mistake ever, it's best to avoid knots in any type of embroidery project. Instead, start a new thread with ​a waste knot, away knot, or by weaving it into the back of previously worked stitches. Knots cause unwanted bulk on the back of the piece, resulting in the work not lying flat when pressed or mounted. Plus, when you launder a project, the knots tend to work themselves free. Generally, bold lines of embroidery require thicker embroidery threads and narrow lines require finer threads. Combine threads to make a thicker strand and separate floss into single strands or groups of strands for working thinner lines. Also, using a thread that is too thick for the fabric chosen can cause problems as well. The threads in the fabric move and shift to accommodate the thickness of the thread used, causing puckering. Inexpensive thread sold in packages as a “Craft Thread” (often 6-strand floss or #5 pearl cotton) are for craft projects such as friendship bracelets, macramé, or children’s crafts and not for embroidery. The quality of craft threads is much lower than embroidery-quality thread. Craft threads fray easily and pill when worked through the fabric. They also may not be colorfast, and the color can bleed into the fabric during laundering. It's best to use a water-soluble fabric marking pen, chalk pencil or fabric pencil to mark your embroidery design on your fabric. Regular pens (sometimes even those labeled as “permanent”) can bleed into the fabric with handling or laundering, or may not wash out completely. Transfer pencils and pens are great for making iron-on designs, but they are permanent. This means that the marked lines need to be completely covered with embroidery or they will show in the finished project. If you want to remove your pattern markings from your finished embroidery, be sure you're using a water-soluble pen or pencil to mark the design on your fabric. When in doubt, test the pen or pencil on a scrap of the fabric you are using to make certain it will wash out. When using iron transfers (either that you purchased or made with a heat transfer pen), fuzzy markings result when you slide the iron back and forth on the pattern paper. Instead, press the iron on the back of the pattern paper just long enough to transfer the markings. Then, always lift the iron when moving to another section. Using an embroidery hoop, scroll frame, or stretcher bars keeps the fabric taut and makes it easier to work accurate, well-formed stitches. These tools keep your tension consistent, help eliminate puckering or stitch distortion, and also keep the work cleaner as you're less likely to bunch the fabric in your “holding hand” as you stitch. Roll fabric on the bars of a scroll frame with the wrong sides of the fabric rolled to the outside (facing you). Doing this protects the fabric from airborne dirt and any oils on your hands, keeping the front of your work clean as you stitch. Always remove your embroidery hoop before putting away your embroidery for the day, and especially before storing it for any length of time. A hoop can leave a crease in the fabric that is permanent or very difficult to remove. It is okay, however, to leave your work in a stretcher frame or scroll frame, as these tools do not cause creases. It's also a good idea to remove the needle from the fabric before storing, in case it rusts. 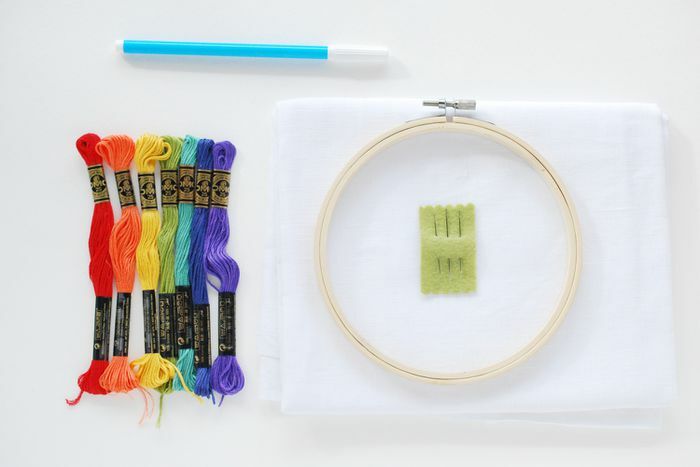 Before you start stitching, make sure you have all the necessary embroidery threads on-hand. This is especially true if you are using older threads from your stash. Older threads sometimes fade or are no longer available, making it nearly impossible to find a new match. Always wash your hands before working on your embroidery project and avoid snacking while you stitch. If you are careful while working on your design, you may not need to launder the finished piece, and that's always helpful! If an item requires laundering, check the fiber content of the fabric and thread before washing. Crewel is often worked on cotton or linen in crewel wool, so you should hand wash those. Other fabrics require dry-cleaning. Washing these items the conventional way can cause shrinkage of the fabric or threads, ruining the finished project. You work hard to create beautiful works of art with delicate and dimensional stitching. Don’t ruin the piece by pressing a project like you would a shirt. Instead, use a special pressing technique to help prevent flattened stitches. 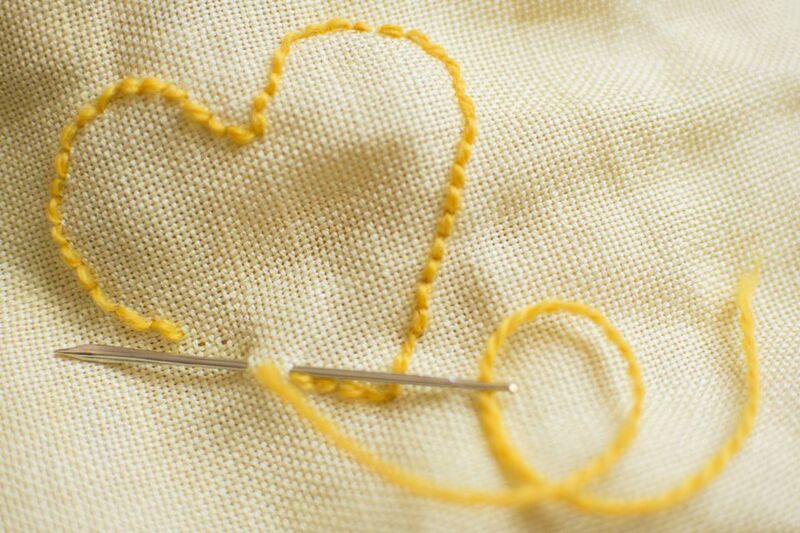 Needlework is an investment of both time and materials. Properly caring for and storing your pieces helps avoid staining and fiber breakage, ensuring you get a lifetime of use from your items. Always use archival quality (acid-free) tissue to wrap each individual piece, and do not store the items directly on wood shelving (wood can leach chemicals that will cause yellowing). Also, do not starch your items before storing, as this can cause fibers to break along a crease or fold. Re-fold your treasures often to avoid permanent creases – or better yet, roll your items on acid-free cardboard tubing to avoid creases altogether. Many fabrics and threads used in embroidery like to promise that they are fade-resistant. But, Mother Nature will still find a way to fade your hard work when displayed in full sun, regardless of what the label on the thread or fabric indicates. To help avoid fading and sun damage, do not display needlework pieces in direct sunlight, and when framing your items under glass, be sure to use spacers between the needlework and UV-protective glass. If you make a mistake and find yourself picking out stitching, do this carefully and slowly. Do not pull or tug threads to remove them. Instead, cut them carefully and remove them with tweezers so that you do not damage the base fabric.